With our new book about our Disney careers, Together in the Dream, now available for purchase, we are receiving requests from podcasters for interviews. This is a new area for us - although we have done phone interviews in past years for other projects. For those not "tech savvy", a podcast is an audio interview that can be dowloaded to a computer, smartphone or other device for listening when it's convenient. Last evening, R.J. and I were interviewed by two delightful podcasters, Rachel and Zeke, for their site, "Behind the Magic". Subscribers to their site receive this podcast automatically, I understand, and they have a broad base of subscribers (nearly 2500 we are told) who are interested in all things Disney. We spent nearly forty-five minutes responding to their questions, and they encouraged us to include our own memories, as well as tidbits from the book to entice potential readers. Rachel and Zeke made it so easy for us, with their professional attitudes and engaging personalities. The time passed quickly and easily, and we can now consider ourselves "veteran podcasters", thanks to the "Behind the Magic" podcasting team. If you're promoting a book - and no matter how you publish these days, I believe it's imperative to "sell yourself and your work", there is no way you can, or should, avoid social media. So far, my husband and I have sent out countless emails, posted our book on Facebook and Twitter, this blog and R.J.'s website (rjogren.com). We also carry business cards, with the title of the book, and the Theme Park Press website on them, to give to anyone we talk to about Together in the Dream. We are lucky in that Theme Park Press, our publisher, also promotes the book on their own website, and in other ways. In addition, RJ and I are approaching local bookstores, and lining up speaking engagements. As actors, it's easy for us to "sell ourselves", but in this competitive publishing world, there is no room for shyness if you want to sell what you've written. Podcasting gives us another excellent way to spread our word - and we've already agreed to do more podcasts in the near future. My husband, R.J. and I are quite excited to have our book, "Together in the Dream" published. But, as writers, our work has just begun. After all, no money can be made from all our efforts if no one knows about our book, or buys it! As actors, we have no problem "selling ourselves" to the public. The good news on that front lies in all the social media sites that allow us to promote our new book. That is exactly what has kept us busy for the last week. Facebook posts, Linked In notices, emails, phone calls, etc., are the first focus for promotion. Beyond that, we are seeking to book speaking engagements, and not just to tell people we wrote a book, and that it's a fun read. Within the pages of "Together in the Dream" are, we believe, motivational and inspiring moments. Our current lives, as basically self-employed entrepreneurs, would not be a reality if we hadn't experienced the first steps toward those goals through our careers at Walt Disney World. In speaking to large groups, be they students or business people, we hope to spread the word, in our own unique way, that believing is doing. So, bottom line: if you know of a group who'd like to book us as public speakers, please contact me through my email: srogren@gmail.com to discuss details and fee. We're as excited about this aspect of our "published" lives as we were about getting this book out there. We hope to share our stories and pursuits to inspire others. Blog Re-Launch for "Together in the Dream"
My last post, way back in March, explained how my husband and I were co-authoring a book that would be released in the fall. Well, now, the release is official and I will be busy promoting the book as well as returning to this blog with a new purpose, and lots of posts! The book, released by Theme Park Press, is titled, "Together in the Dream". The subtitle vividly describes our subject matter: "The Unique Careers of a Husband and Wife in the Early Decades of Walt Disney World". We wrote alternating chapters about our "lives at Disney", choosing to highlight the positive, amusing and, ultimately, life-changing stories from our individual experiences. It was great fun to write this volume together, and we hope our readers enjoy it. We were also thrilled, and humbled, that a Disney Legend, Alice Davis, wrote the foreword for the book. (Alice's Disney career involved designing costumes for the Disney Parks' attractions.) She said that, while reading excerpts, she "giggled with enjoyment and delight". Those words meant so much to us, since she lived those early days as well, as did her husband, one of Disney's animation giants, Marc Davis. In upcoming blogs, I'll give you some detail about the process we used to write "Together in the Dream", and how it all came together in the first place. We'd been approached several times in years past, to do a book like this, but it was Theme Park Press and its publisher, Bob McLain, who convinced us that we had finally found the perfect venue in which to release our work. I hope you enjoy it, and, please send me any feedback, comments, etc. AND, if you know of a group who would like to host R.J. and me for a speaking engagement, please contact me via e-mail at: srogren@gmail.com for information on scheduling and pricing. As you who read this regularly know, I've been "off the grid", so to speak, in the past year. That can make it difficult to get going again. Today, I did something that hit a vital nerve. 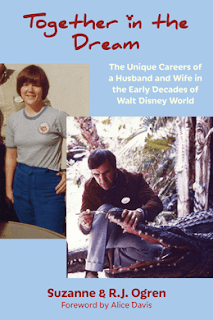 For months now, my husband and I have talked about writing a book (and we've been encouraged by knowledgeable friends), based on our combined experiences working at Walt Disney World. Recently, we learned about a publisher who is focusing on just that type of thing, so we've slowly been formulating a unique perspective that would interest this publisher. I don't want to go into detail about the specifics of the proposal; call it superstition if you want. The great thing about working on the draft, then perfecting it to fit the criteria, and, finally clicking that "submit" button - it set something off in me that's been dormant for months. I felt like a real author again. That might sound odd from someone who has been published in several venues, and is getting ready to see her first novel in print. But it is true of creative people, I think. If you lose your momentum, or, in whatever way, absent your chosen creativity, it becomes a monumental mountain to ascend and find inside you what propelled you to take on that challenge before. Today, I knew that I'd sparked something inside, and now I'm anxious to move forward with new ideas, and actually put them on paper. I'll let you know if our proposal is accepted, and I'll be back soon with specifics on my new works in progress. It isn't usually my tendency to write posts about the current world situation, or politics, or other similar topics. Today is an exception. Two things have influenced my decision. First, I'm reading a fascinating book edited by David Cay Johnston entitled, DIVIDED - The Perils of our Growing Inequality. Johnston is a Pulitzer Prize winner author/journalist who has assembled speeches, articles and essays by some of the best minds alive on the subject of the disparity of our society. He covers the financial chasms under such subheadings as education, policy, family and health care, among others. I devour good non-fiction reads and this one I can highly recommend. It gives me new views on my inequality normal as I term my everyday life these days. In that thought-provoking vein, my second influence came from viewing the latest installment of my favorite television series, Downton Abbey. I realize that the book and this show may not seem to have any connection, but stick with me. When I use the expression, inequality normal, it's to give a name to how much my middle class existence has withered away in the last decade or so. At first, I was oblivious to it, as were thousands of others, and until recent research reading, I also wasn't privy to the decades of downward spiraling our entire economy experienced that brought us to this unwelcome state. I've had to face the not-so-welcome fact that the lifestyle my husband and I took for granted as normal during childhood, young adulthood, our married years, etc., just doesn't exist for us anymore. It's not because we've changed how we live; it's just that the financial circumstances of our country have shifted so radically that our middle class is no longer - and along with that goes our prosperity, growing incomes, and the rest. We don't expect to be supported by the government; we just want to be able to finish out our lives as we've always done - working hard and looking forward to better things because of it. In other words, we want the word hope to still have a ring of reality for us. Our children and grandchildren are primary in my thoughts as well. I see them struggling as they work even harder than we have, and seeing no concrete results for their labors. It certainly isn't the legacy I wanted them to inherit. So, you may ask, what does Downton Abbey have to do with this? Well, it isn't the first time that the brilliant writer of that show, Julian Fellowes, has managed to parallel the upper class scenarios of early 20th century England with those of current day situations. And it was my favorite character from the series, the dowager countess (played by Maggie Smith) who invoked the line that hit home for me: "Hope is a tease - designed to prevent us from accepting reality." It may be a sad commentary, but, unfortunately, it is a truism for me of late. I don't like to admit it, and I am lucky to have friends and family who give me love and support, but, in my private moments of contemplation, it's something I can no longer dismiss or wish away. In accepting the reality of my circumstances, I do find it much more difficult to think about hope and inequality normal as parallels. And it was important for me to say that in print. I read an inspiring piece of writing this morning, by a writer whose advice always seems to inspire me: C. Hope Clark. Her words struck home, yet again, because my week has been hectic and I was berating myself for not getting a blog post written. If you are a writer not familiar with Hope's work, or her wonderful newsletter online, I encourage you to become familiar. And please read her post this week about "The Year of NOT". Without condensing the entire piece, suffice it to say it will give you some breathing room. She addresses the many, many, many things that writers are "pushed to do" in order to "be a writer". And, in her research, she has discovered that many writers have called a halt to much of it. The last sentence of her essay was this: "This is the year of NOT; the year of not letting others interfere with the writer you were meant to be." I agree. So, here's my promised weekly post. And, even if you're not a writer, Hope's words may speak to you. Check them out, and let me know. Yesterday I celebrated what is referred to as a milestone birthday. Since I consider that reaching every new year is a milestone, I'm not sure I agree with the designation of that term. The day was, however, one I will always remember because of the myriad ways I received special attention. To begin with, I am so grateful for the social media contacts that allowed me to receive dozens of congratulatory posts; friends, relatives, and contacts from around the world. I am a lucky woman to have those people in my life, who take the time to send well wishes and words of love. I even had phone calls from a couple of friends I don't get to speak with as often as I'd like, and that added to my joy. My children, and theirs, contributed to my Happy Day with phone calls, gifts, etc., and my husband (the artist) made me a singularly wonderful card and a decorated cake. Last evening, he and our oldest, grandson, Alex, treated me to a dinner out at a special Italian restaurant near us. The attention from the two of them, as well as the restaurant staff, added to my overflow of happy moments. I guess, in this busy, busy, busy society we call normal life these days, it means even more when you realize that others consider your special day a day to make sure you feel special. So, my milestone day served to remind me that I am more than lucky to have such people around me It also strengthens my resolve to work toward better days ahead this year, because I know I have all of them cheering me on. I still subscribe to the quote, "To me, old age is always fifteen years older than I am", so I don't plan to ever quit celebrating - whether it's a milestone, or just another year. Having so many others celebrate with me, though, is what it's really all about. Thank you all. Wasn't sure just how to start this one. After all, it was May something when I last posted. Thought about explaining why I have done no real writing since then: not a blog, a short story, the beginnings of another novel - nothing. But this past year hasn't been about me. It's been about the man I've known longer than anyone (except my parents); my beloved R.J., and he's the one who got priority over everything in 2014. Not to dwell on too much detail, but he suffered a severe concussion that prevented him working for over four months, then had two injuries and a virus that escalated his enforced leisure into a couple of additional months. I became caretaker, nurse, and person in charge of all things business and home. And his good health and well-being were all that mattered to me. The good news is that he is now back to his old self, busy creating new projects, and encouraging me to resume my writing career. So, with a New Year in front of me, I decided it was time to explore my creative bent. I'm starting with this blog because it's "already out there", so to speak. My plan is to post something here at least once a week. There will be a variety of subjects: old topics, new interests, some critiques, etc., even recommendations of good books I read. Of course, I will be keeping everyone apprised of my published writings. I've even decided to include photos, occasionally, to make the look of the blog more inviting. Thanks to those of you who continued to check in here, and your searches will no longer be in vain, I can promise you. I'm eager to be back at my keyboard, and I have lots of ideas in my head. Please comment on my blogs - first of all so that I know that you're reading them, but, more importantly, so that I know what you most want to read about, and to learn from you how I'm doing. These past months have made me much more grateful for all the wonderful avenues of my life, and I'm eager to explore new ways of appreciating them. That's the reason for this post title, and now it's time to begin.